A few months ago, an Ulta opened up a mile away from me. This has been a blessing and a curse. It's nice to be able to just drive 5 minutes and be at Ulta's doorstep whenever I want, but that is also the problem. I really try to keep my visits there to a minimum. I only really go once a month now, and always with a coupon! I found this pretty on sale there last time. 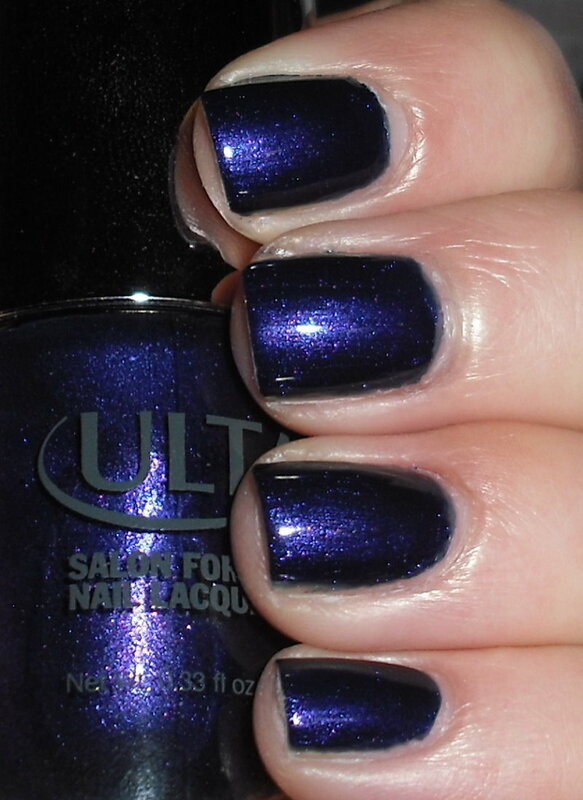 Love My Blackberry is a super glowy blue-violet shimmer. I love the shimmer in this. The color really changes depending on how the light hits it. I like how at certain angles the vibrancy of the color fades into black on the edges. I hope that makes sense. I'm terrible at describing some of these pretty polish phenomena. It's definitely a neat color! I'm wearing an Ulta shade today too! I know what it's like to have an Ulta so close to your house....I have one in a 5 minute walking distance from mine! I am there ALL the time! This is a pretty shade! Ooooh....I like this. I haven't tried their polishes yet...I may start with this one! I love Ulta polish! Wow! So nice!!! This is really pretty!! I agree, love the shimmer in it. Oh, and I understood your description, heehee! I keep saying that I wish there was an Ulta here, but it really doesn't need to me. I would be unable to stand the temptation. Gorgeous shimmer! Loving this shade - and great name for it too! I soooo wish we had an ULTA closer than a 5 hr drive from me (and that's 1 way).